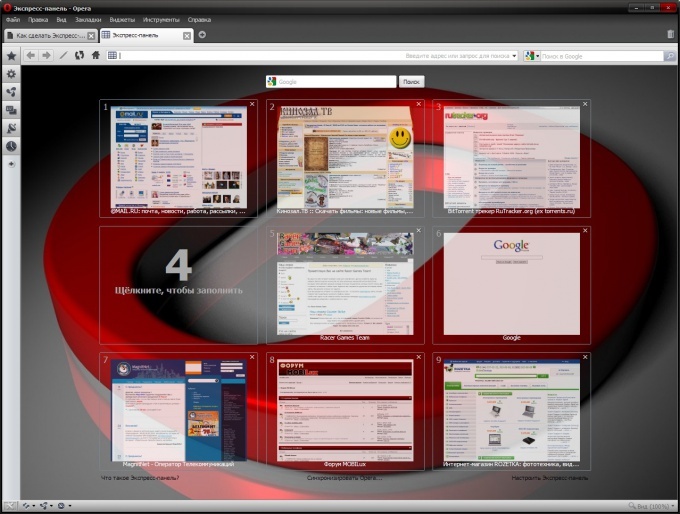 Convenient and functional browser Opera allows you to configure the bookmark in any desired order, using standard sidebar menu, and speed dial. One of the latest and most convenient versions free browser Opera 11.50, build 1074. First we need to configure the sidebar of bookmarks. Click on the icon Opera in the upper left corner. Select "toolbars" – "Sidebar". Or press "F4". The left side appeared side panel, location of which is configurable. Top to bottom on the panel buttons are: Bookmarks (in the form of an asterisk), Notes, "Downloads", "History" and at the bottom a button "Sidebar" (a plus sign). Click on the "Sidebar" and select "Customize". Opens the window menu "Design" where you can customize the display of the side panels and their location. Opera provides the option to configure the desired site in the web panel. To do this in the menu "Registration", please note the paragraph "Opera can show a bookmark as a sidebar. Click on the "Add web panel". Opens the window "bookmark Properties". In the "Address" field enter the complete address of the desired website, in the Folder field, specify the folder in Favorites where there will be a link to this website. Select where the button will be displayed site – tick the Display on the panel of bookmarks", "Show in sidebar". Click OK, now the sidebar appears on your site. If the need for such a panel disappears, right-click on the site icon and select "Remove panel". To set up the main list of bookmarks, click the star on the side panel. By default, the bookmarks are the links folder Mozilla and recycle bin. Above the folder list there are two buttons, "Add" (plus sign) and "View" (in the form of a wrench). Click on the "View" to customize the appearance of the bookmarks bar. It is proposed to arrange the folders in a tree structure, with separate folders or make separate folders. Bookmarks can be sorted manually, this is a very handy feature for the location of the links in any convenient manner, a folder can simply be dragged with the left mouse button. You can also arrange the references by date – time of visit, the name, i.e. just in alphabetical order. Also, Opera provides your one-stop function speed dial. In order to access the most popular sites with this panel, create a new tab, click on one of the nine cells, where it says "Click to fill". In the opened window you will be offered several options for filling, including frequently visited pages and open pages. You can select a web address from the list provided or enter your own. You can also drag the address from the bookmark by using the left mouse button, panels, or any other source that displays the web address.